By far, one of the most common design mistakes we see is short-term space planning. If you’re designing a custom home, you’re likely to live in it for a while. That means the spaces you need now may change over the next few years. Consider how long you’ll stay in this home and what types of spaces you’ll need during that time. Where do you spend most of your time at home? Do you cook regularly, or are you rarely in the kitchen? Do you work at home? Do you need a home office? Do you have family or friends who visit regularly? Do you need space for a guest room? Do you have or plan to have children and need bedrooms for them? Do you have older children who will be moving out? If you’re building a play room or game room, what will it be used for in a few years? Do you have hobbies and activities that need extensive storage? Good space planning can help keep your home useful throughout your time in it. If you anticipate lots of changes, it can help to design multi-purpose rooms. Consider whether a guest room can be converted to an office, or whether you’ll need two different rooms. Doing it alone might seem like a money-saving idea, but this is a major task and choosing not to use professionals can be a costly mistake. Experienced designers and builders will have the knowledge and tools to help you plan and build a house that is safe and well-crafted, within a set time frame and budget. Do your research when choosing professionals, ask for their recent references and view some of their previous building projects. Some Architect firms provide both design and build services, it is better to hire them, because they will be the single point contact for you from start to completion of the project. 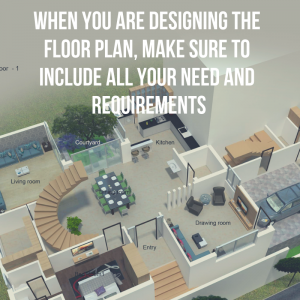 It’s common to make a few changes to a custom floor plan. You may find that you want to change the materials you use for flooring or cabinetry. You might also realize that you want to make larger changes like adding a room or changing the layout. 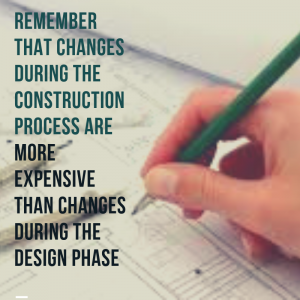 However, remember that changes during the construction process are more expensive than changes during the design phase — and that cost isn’t just financial. There may also be delays in acquiring the supplies needed, and your timeline might be slowed down by these delays. Additionally, the extra construction may add to the total cost. So, discuss with your Architect and make the necessary changes in designing stage itself. It can be easy to choose basic materials and fittings, especially when your budget is a bit tight. Keep in mind that doing this can be very costly in the long run. 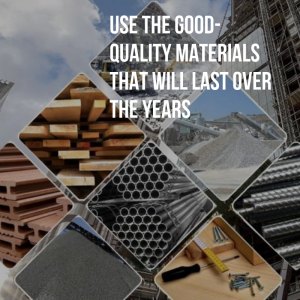 While it is important not to overspend, careful planning should go into buying good-quality materials that will last over the years. This is especially vital when deciding on fundamentals such as walls and floors, and plumbing fixtures and fittings. Even if it means you have to save a little longer before you can start building, it’s worth it to avoid a house that starts falling apart after a year or two. 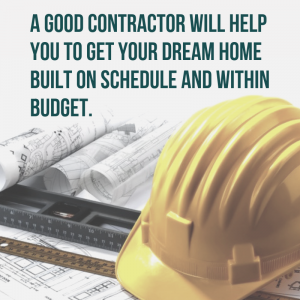 It’s important to establish a budget when building a home. The budget should include a slush fund that takes into consideration unforeseen circumstances and overages, because even with the best-intentioned estimate, incidentals will likely still come up. All of these answers can help you to find the right professional to build for your home. Are you ready to get started on your new project? Kreative House” is known as the most sought after firm for residential architecture and interior design in India. Kreative House is famous for Design and Execution of Luxury and Green High end Residences without compromising on innovativeness in design and quality in execution”.